The next day we have a private tour with the company that failed to pick us up in Kusadasi. This time they are waiting for us dockside, and waiting for us in style, The car is a large black Mercedes, and the driver is wearing a black suit and tie and very slick black sunglasses. It is most impressive, but we are concerned that we may have the Boca Raton Mafia’s car by mistake. The guide is a large rumpled man in oversized rumpled clothes and envelopes our hands in his large rumpled fist. He is extremely knowledgeable and it turns out that he is very well connected. He was the guide for the Clintons when they came to Istanbul as well as many other world dignitaries whose names he drops into the conversation. He is making it quite clear that the company has sent it’s top people to look after us after the unfortunate misunderstanding in Kusadasi. The fabulosity meter is ticking upwards. We have not specified what we want to see, but have told the company that we will have seen most of the nearby sights on our own, and would like the guide to take us a little further afield to places that the average tourist might not get to. 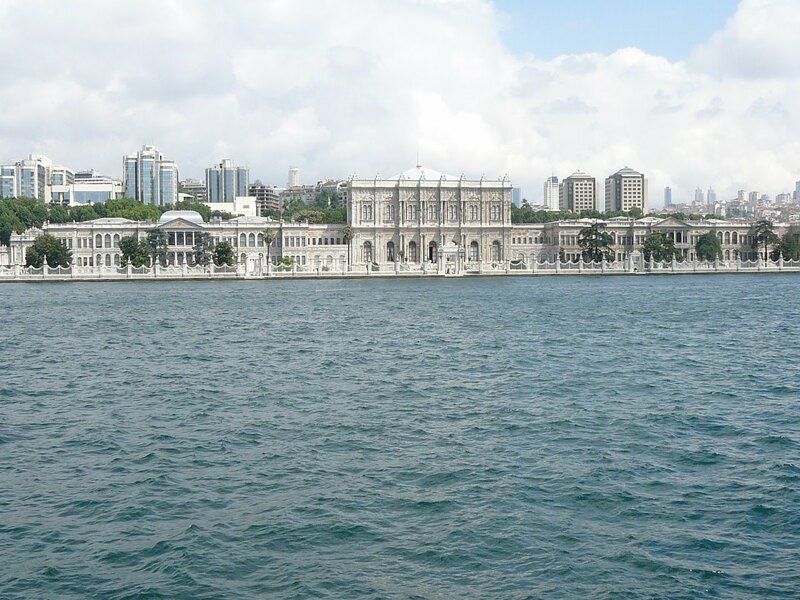 The guide informs us that we will start by taking a ferry down the Bosphorus, but instead of coming back to the European side of Istanbul we will get off on the Asian side where the large shiny black Mercedes will be waiting for us and we will do a tour of the Asian side of Istanbul. The ferry is packed with tourists, but our guide knows to get on early to get good seats on the open top deck. After a little while we are aware of some familiar voices behind us. For a while we just sit and listen to the Boca Raton Mafia without turning round. 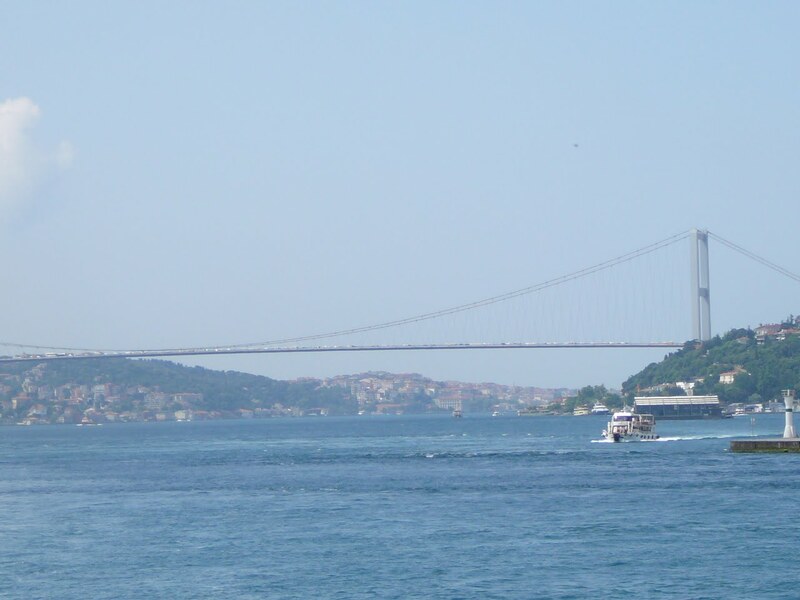 I thought you would like to see the other side of the Bosphorus” replies, the guide. The tour guide gives her a brief geography lesson. “But we have just spent two weeks on the Black Sea” she exclaims, getting more agitated by the moment. But Ms Brooks is not happy and not willing to back down. “Well they’re all the same” she says with an air of finality, effectively closing the discussion. 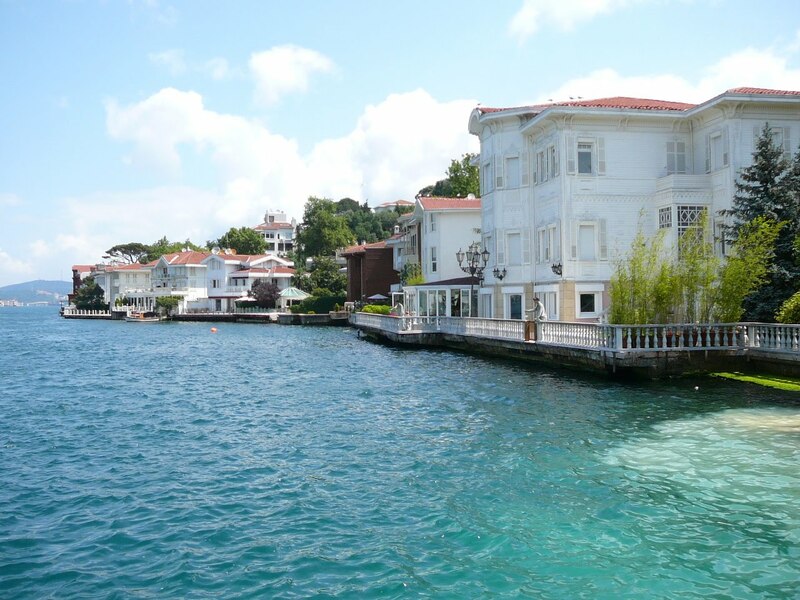 The Bosphorus is magnificent, lined on both sides with wonderful Palaces, huge estates, and stunning Summer Residences. The bridges remind us of San Francisco. At one point our guide is telling us that we are about to pass the two most famous and expensive Hotels in Istanbul that are side by side on the shores of the Bosphorus. The Kempinski and the Four Seasons each bought adjacent small Palaces and turned them into Hotels. Our guide’s conversation not unexpectedly catches the attention of Louise Brooks who stops pouting and turns to listen, and then realises who we are. After we have said our hellos, Louise tells us that she couldn’t help but hear our guides conversation. “See that pink building” she says ”that’s the Four Seasons! And see those two windows on the corner of the top floor. THAT IS WHERE WE ARE STAYING”. She is hardly able to contain her excitement. “But why are you getting off HERE?” Louise says. “Because we want to see some of the Asian side” I reply. “But there is nothing there but a few small fishing villages” says Louise, with great authority. The Mercedes is waiting for us and we do a drive around the hills looking at some of the towns and magnificent houses. We then cross a bridge that looks like the Golden Gate Bridge, but is even busier. It takes us back to the European side where the guide says he is taking us for the lunch that had been promised us because of the missed tour in Kusadasi. We go to a very elegant waterside restaurant and have a wonderful lunch overlooking the Bosphorus, while the Fabulosity Meter keeps ticking away. We are beginning to feel quite happy about missing the earlier tour. 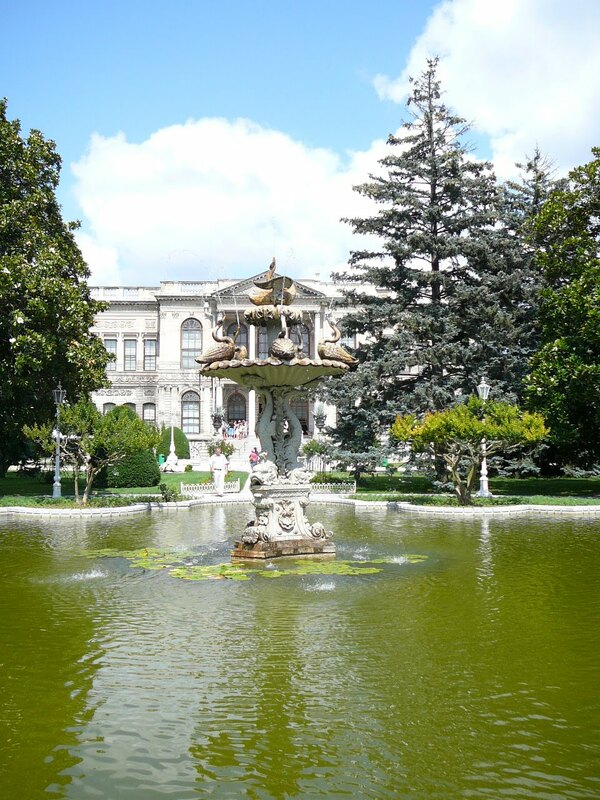 We end the day looking around the fabulous Dolmabahce Palace on the Bosphorous. 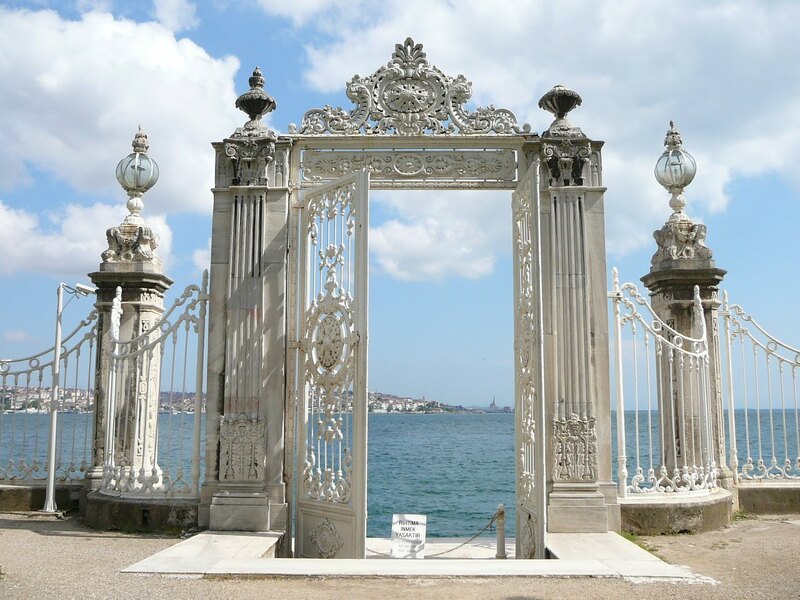 Built by a Sultan in the 1850’s who felt the Topkapi Palace was outdated and that the Sultans should have something infinitely more splendid and in line with European Palaces . He apparently knew of Versailles and wanted his home to be even more more spectacular. It has to be said that he might have achieved this goal, though with distinctly less Gallic chic. Sadly we are not allowed to take photos inside, but the Palace is incredibly opulent and way over the top. I think this Sultan must have had a Fabulosity Meter as well. But, by his out of control spending, he set in motion the downfall of the Ottoman Empire, as he spent so much money on the new Palace that there was little or no money left for the army and the defense of the country. Within 50 years they were going hat in hand to Europe asking for huge loans. On our way back to the ship, the guide’s phone rings. It is the owner of the company wanting to speak to us. He apologises profusely for the previous mix up, hopes we enjoyed today’s tour and finishes by wishing us a Happy 40th Anniversary. Canada Travels has been spreading stories, and this tour company definitely knows how to treat it’s customers. How fabulous! I'm starting to really like Don Corleone!